They come in an assortment of colors with available options of dark as well as light centers. Apart from the traditional yellow sunflower, there is also the flaming red color and the chocolate-colored sunflower. Another interesting variety is the bi-colored sunflower with a tint of orange in the inner side of the petals and yellow on the outside with a large dark granular center. They have a good vase life and last long when met with proper care. They are cut within 24 hours from delivery and shipped directly from the farm to ensure freshness and firm blossoming. Whole Blossoms is the perfect place if you are looking for ‘buy sunflowers near me’ sources all around, Whole Blossoms works on providing you a hassle-free flower experience. A sunflower type to suit all! The red sunflowers are imported from Columbia and are available all year round. Their steams are 20-24 inches long, and their width is about 3.5 inches in size with the center being approximately 1.5 inches in diameter. Because of its scarlet color, it is especially suited for Halloween-themed weddings and also appropriate for the fall season. The Teddy Bear sunflower is a seasonal novelty variety. Comprising a small center, this variety with its softness adds warmth and happiness to the surroundings. 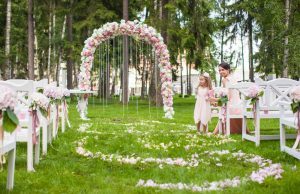 They are known to symbolize loyalty and are good choices if you are looking to convey stories and meanings through your wedding décor. 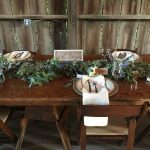 If you have a leaning towards a rustic look and a love for nature, sunflower-themed weddings offer numerous possibilities. 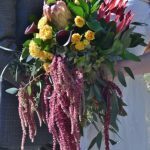 Starting from a wooden ceremonial arch with sunflowers embedded in it, to sunflower wedding centerpieces or multiple placements of individual sunflowers on the table, there are multiples ideas to choose from. 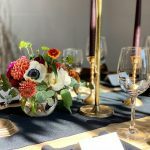 Sunflower wedding centerpieces are sure to become the life of the table with their radiant charm, giving the entire wedding reception a lively feel to it. 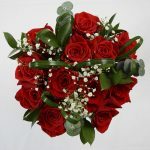 They can be used as an exclusive bunch or paired with other subtle colored flowers and green leaves. 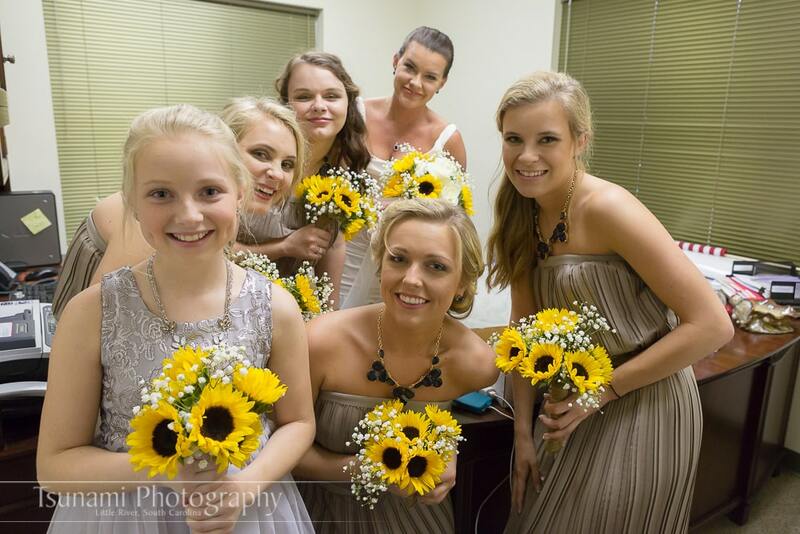 Hanging sunflower pomanders are also a popular wedding décor idea. Despite their simplicity, they successfully influence the setting of the place for the better. The arrangement works as a good background and thus makes for a picture clicking spot. As small adornments and accessories in the decoration, sunflowers make their presence felt. 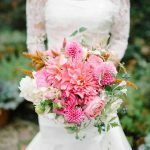 Bridal bouquets consisting of cheap sunflowers along with an assortment of other flowers like red roses and daisies can come together to add a touch of elegant cheeriness to the bride’s attire. As a boutonniere, a sunflower entwined with greenery works as an ideal finishing touch to the groom’s classic summer suit. 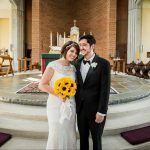 As corsages worn by the mothers of the bride and the groom, the sunflower with its specific structure adds to their wise and caring personas. When worn as a flower crown, it is bound to give you a happy, bubbly look with its bouncy feel. Cheap sunflowers when put on buns as a hair accessory, make a lovely fashion statement. How about a wedding cake with a hint of sunflower theme? The use of cheap sunflowers in wedding cakes makes for a delicious aesthetic. To add a personal touch and make the wedding cake even more special, the couple can use sunflowers that they have grown themselves. 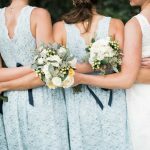 Another trend that has been becoming popular is the giving away of sunflower seeds to the guests as parting gifts to commemorate the memory of the wedding day through future sunflowers. This act of kindness for the environment works in harmony with the nature of the flower itself and adds positivity to the special day. If anything, one can never go wrong with cheap sunflowers, because of the vibe they bring along with them. 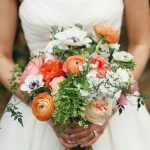 Their natural beauty and likeliness to the sun seem to be the bearer of light which is a perfect ingredient for weddings. Bold, bright and beautiful, sunflowers give you a way to make your wedding a way to express your personality through artistic means. 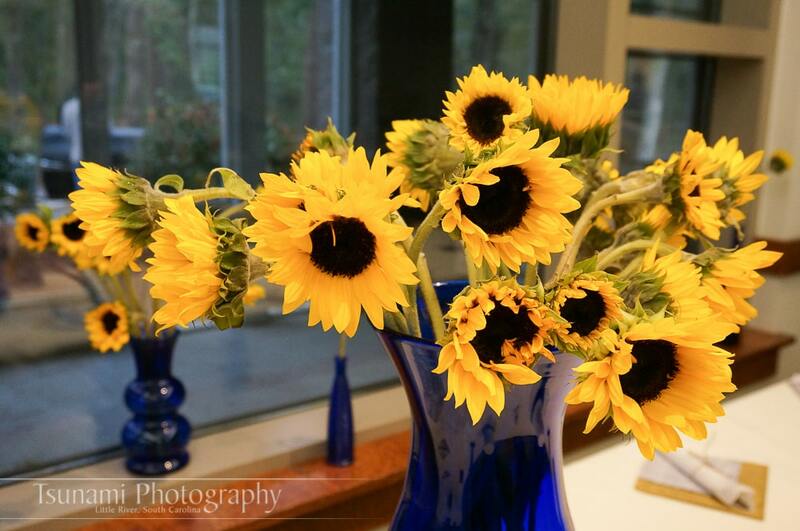 So, you should let sunflowers cheer up your wedding with floral arrangements and sunflower wedding centerpieces. To buy sunflowers near me, visit Whole Blossoms and prepare to have a great wedding celebration.